A long, but interesting and fun tarantino movie with enough violence and plot intricacies to hold your attention. Another Tarantino success, this guy is about as talented as they get. It’s him and the coen brothers who have the most flawless of records where pretty much everything they touch turns to gold (quality-wise, not necessarily box office-wise.) With Django, Tarantino has taken a slavery story and made it into a spaghetti western. All that really means is that there are shootouts and the heroes ride horses around. as always, Tarantino wield his brush mixing in great action with clever dialogue. this movie and Inglorious Basterds (Tarantino’s film that proceded this one), mark the filmmakers two revenge fueled men on a mission, in history, movies. They are both terrific films loaded up with as much humor as anything else. Slavery might be a dramatic idea, but this movie approaches it with attitude and style and comes away being a lot of fun. Django Unchained is a Quentin Tarantino movie, and like all of the Tarantino movies from the past decade or so, it is about revenge. First, he had Uma Thurman going after the group of assassins that left her for dead in Kill Bill. Then he had a group of Jewish soldiers hunting Nazis in inglorious basterds. Now, with Django, he has a slave teaming up with a bounty hunter to go after slave traders. The reason why the movie works is that it is actually a lot more than that. 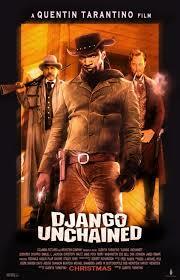 Django, played by Jamie Foxx, is not after the money of being a bounty hunter. He is not even really after his freedom. He is after his wife. That is because his wife, Broomhilda, has been sold off to another plantation, and Django wants to be with her again. That might be his mission, but the movie doesn’t really get to it until about halfway in. Instead, the storyline concentrates on the road it took to get Django to a place where he could actually propose going to this notorious plantation, called Candieland, to free his wife. 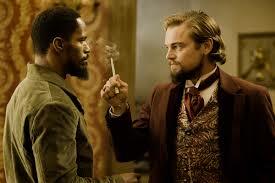 Before he can get his partner, King Schulz (Christoph Waltz) to agree to help him, Django has to prove himself. At the start of the movie, Schulz rides up to a group of slaves in his dentist carriage. He ends up killing one of the slave traders who is giving him a hard time, and injuring the other. Than he buys Django from them and goes on his way. His reason for wanting Django is that he has been hired to kill a group of men, known as the brittle brothers, and Django knows who these men are and what they look like. I like the way Schultz asks Django questions about them, before freeing him, to make sure that he really does know who these men are. That is Quentin Tarantino paying attention to details. Django and Schultz go on their way; with Schulz educating Django as much as possible about the way, things work in society. They have a cool relationship and Django is a fast learner. Soon they are in a saloon, sitting down for beers and shooting the sheriff of the town in the chest. That gets them into some hot water that Schultz cleverly figures out a way to climb out of. Now it is time to go after the brittle brothers. I love the way that none of what happens to these men go according to plan. That is actually Tarantino’s M.O. whether it is Reservoir Dogs, (trying to meet up in a warehouse after a botched robbery); Pulp Fiction (just trying to retrieve a suitcase and deliver it to the boss), or Inglorious Basterds (the big theater premiere night), nothing in Tarantino’s movie ever goes according to plan. In addition, it is a lot more fun that way. After the Brittle brothers handled, and the KKK members that come after Django and Schulz are out of the way, the movie hits a bit of a slow spot. It is a situation where the characters are ready to head to Candieland, only the weather is too cold. Schultz agrees to go with Django if he just waits until the end of the winter. In the meantime, they can work together to kill people and collect bounties. Therefore, that is what happens. It is the only slow point of the movie, because it really has nothing to do with the story and is a sort of bump in the road. A deviation from their path. Soon enough our heroes are headed to candieland, and we really do get what feels like a whole other half of the movie. In many ways, this movie reminds me of Tarantino’s last film, inglorious basterds. Both movies are about a couple of guys with a plan. Their plan is something big, and does not really make its way into the story until halfway into the film. Both plans are about infiltrating the enemy’s camp, where our heroes will be greatly outnumbered. In addition, in both movies the plan completely falls apart. Leonardo Dicaprio plays Calvin candie, the slave owner who they come to see. They want to buy Broomhilda from him, only have a clever way of going about it. Their plan is to pretend as if they have no interest in her. Instead, they pose as Mandingo fighters. Mandingo fighting is something tarantino made up for this movie (at least in name), and it is slave fighting. The idea here is that if these two can convince Calvin to sell them a slave fighter for a large sum of money, then he will gladly throw in a slave girl (Broomhilda), for a cheap price. Things get pretty out of control when Calvin’s slave friend Stephen, (played by a terrific Samuel l. Jackson, in my favorite performance of the movie), is able to figure them out. This really is like inglorious basterds, when the Germans in the underground bar were able to figure out that the Jewish soldiers were really imposters. From there we get some great gunfights and a few more twists and turns to keep the movie alive. There’s one gunfight in particular that is so loaded with humorous buckets of blood that one can’t help but laugh at how ridiculous it all is. This scene is very much in good fun and it is filled with energy. Django Unchained is a smart and enjoyable movie. It is far off from Tarantino’s great films, but certainly is a very good one.